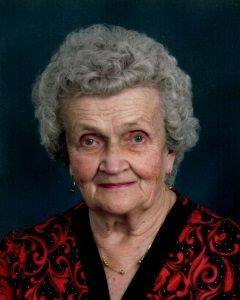 Elvera Mackenthun, age 93, of Norwood Young America, Minnesota, passed away on Tuesday, November 6, 2018, at her home at The Harbor in Norwood Young America, Minnesota. Funeral Services will be held Saturday, November 17, 2018, 11:00 A.M. at Emanuel Lutheran Church in Hamburg, Minnesota, with interment following at the church cemetery. Visitation will be held Saturday, November 17, 2018, from 9:30-11:00 A.M., 1-1/2 hours prior the service at the church. Elvera Selma (Behrmann) Mackenthun was born on November 16, 1924, in Stewart, Minnesota. She was the daughter of Ernest and Lydia (Bauermeister) Behrmann. Elvera was baptized as an infant on November 30th, 1924, and was later confirmed in her faith as a youth on April 10th, 1938, at St. Matthew’s Lutheran Church in Fernando, Minnesota. She received her education at a country school in Fernando thru the 8th grade and then attended Stewart Public High School graduating with the Class of 1943. After graduation, Elvera worked at the Strutwear Garment Company, Glencoe, Minnesota. On October 19, 1947, Elvera was united in marriage to Harvey Mackenthun at St. Matthew’s Lutheran Church in Fernando, Minnesota. They made their home on their farm in rural Hamburg, Minnesota where she worked side by side with Harvey milking the cows and working in the field. After 45 years, they moved into a home in Hamburg. Elvera became a resident of The Harbor in Norwood Young America, Minnesota in September of 2016. Elvera and Harvey’s marriage was blessed with five children, Leon, Karen, Kevin, Paulette and Paulene. They shared over 55 years of marriage until Harvey passed away on September 27, 2003. In addition to being a loving wife, mother and homemaker, Elvera was an active member of Emanuel Lutheran Church in Hamburg, where she canned for the school, quilted blankets and folded bulletins for many years. Elvera enjoyed cooking, baking, quilting, and playing cards. She loved having Sunday meals with the family and once her daughters moved away, she cherished their Sunday phone calls. Elvera treasured the time she spent with family and friends. Elvera passed away Tuesday, November 6, 2018, at her home at The Harbor in Norwood Young America, Minnesota, at the age of 93 years, 11 months and 21 days. Blessed be her memory. Elvera was preceded in death by her parents, Ernest and Lydia Behrmann; husband, Harvey Mackenthun; children, Karen Mackenthun and Leon Mackenthun; sisters, Lena Sell, Irene Domeier and Phyllis Brede.